Recent Red Letter Grant winners. Twice a year, the Red Letter Grant is awarded to female entrepreneurs right here in the Chippewa Valley. Becca Cooke, owner of Red’s Mercantile, 224 N. Dewey St., Eau Claire, started the grant to encourage women to pursue their business endeavors. 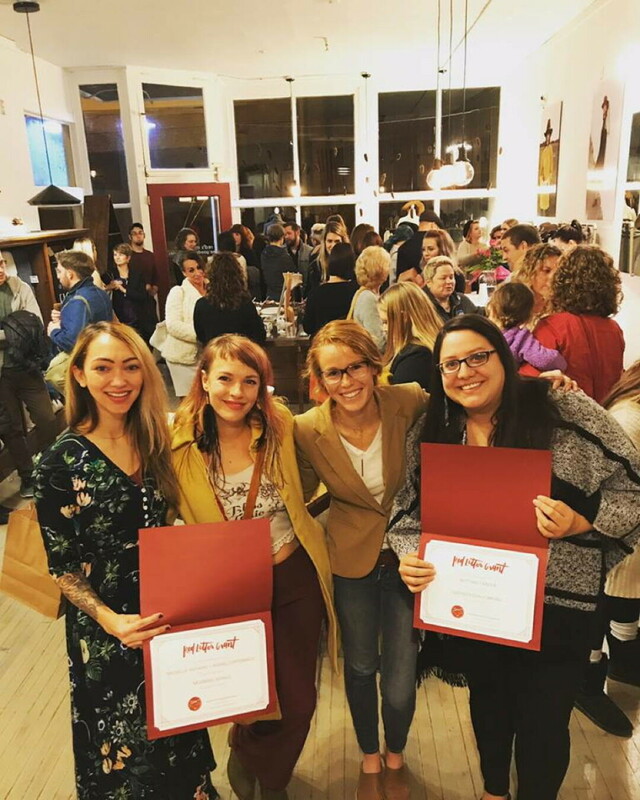 Michelle Anthony and Rachel Duffenbach at Moonrise Aerials, and Brittany Tainter at Giizhig Design Company were the most recent grant winners. The applicant pool was full of businesses offering fun and unique services. These entrepreneurs represent a trend of independent, women-led businesses. Elizabeth de Cleyre, Jill Heinke Moen, and Margaret Leonard are the team behind Dotters Books. The store currently operates online, and hosts pop-up shops around Eau Claire. To find out where they’ll be next, check out www.dottersbooks.com/pages/events. Lacey Ashwell’s store (101 N. Bridge Street, Chippewa Falls) isn’t your “typical” lingerie store. It celebrates women of all ages, sizes, and shapes. The store’s merchandise includes nursing, mastectomy, and post open-heart surgery bras. Lacey’s is on Facebook (www.facebook.com/lacedbylacey/). Based in Chippewa Falls, Maggie Cook provides remote marketing services to small businesses and nonprofits. Services include digital market, event coordination, and photography. Find out more at www.maggieleighmedia.com. Sara Hansen helps businesses manage their online presence by offering social media management, content creation, and travel writing. Check out www.rebelwritingco.com. Located at 415 1/2 S. Barstow St. in Eau Claire, the studio offers classes for children and adults. Childcare is available during many of the adult classes. Other services include Reiki sessions and essential oil consultations. Learn more online at www.skyyoga.yoga. Still in the planning stages, Three Foodies is a partnership among Michelle Lien, Amanda Olson, and Nick White. The trio will be offering a food and history tour in downtown Eau Claire. Stay tuned for all the tasty details. Located outside of Mondovi, Andy and Stephanie Schneider raise pork, beef, lamb, and poultry. They also make and sell skincare products and candles. Workshops and other events are hosted right on the farm. Visit www.togetherfarms.com/annual-events to see what’s happening next. The next round of Red Letter Grants will be awarded in the spring. For more information on the grant, visit www.redsmercantile.com/pages/the-red-letter.